Between the end of November and the end of January we signed up 91 new members. An executive review of our PST expenses showed that we were paying the provincial tax on the printing of our publications, though such spending is PST-exempt. 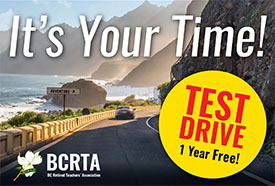 Office staff combed through the last four years of printing bills, submitted a claim and in January the BCRTA received a refund cheque from the BC Minister of Finance for $16,500. The Board has authorized the purchase of some new computer equipment, as our existing systems have completed their depreciation cycle, and in some cases were no longer supported. The need for reliability in our data and backup systems made the purchase a number one priority. A new backup system is now in place. We are also pleased to inform you that we can now accept payments using credit cards in person and by phone. Also on the technology and systems front, the BCRTA is working with our auditor to identify and implement accounting software solutions that will meet the needs of our changing organization. In every household, there comes a time when the accumulation of material becomes such that there is a need to purge. That time arrived in the BCRTA photocopy room in November and continues. Apart from “just house cleaning” the necessity of rearranging office space was imperative. The executive director needs an office and board members will benefit from a discrete work/meeting space. To that end the Finance Committee recommended and the Board agreed to spend up to $20,000 from the Growth and Expansion Fund for renovations to our existing office space and up to $10,000 for furniture/fixtures from the Capital Fund. Authorization, labour and timelines for this renovation are under the jurisdiction of the BCTF as they own the building. Finally, we continue to seek efficiency in spending and investing. One GIC matures in February and a decision has been made to cash that in and hold it in our high interest (1.85%) cash account until needed.